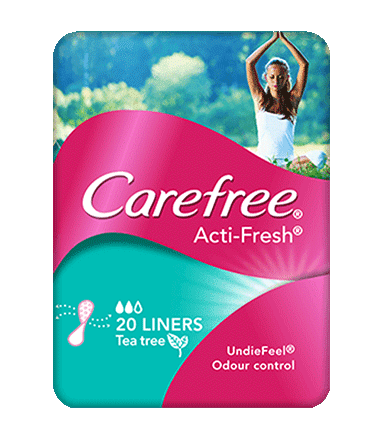 CAREFREE® Acti-Fresh® Tea Tree Liners are a great way to stay clean, dry and fresh on the days between your periods. They are 2 x more absorbent* with a super-thin absorbent layer to keep moisture and odour away from the body. The White Tea and Tea Tree extracts help to control the growth of odour-causing bacteria, and they have natural UNDIEFEEL® technology meaning they feel just like your undies. A drop absorbency rating of 2 means they are suitable for light discharge and active lifestyles. *vs Previous CAREFREE® ACTI-FRESH® Liners.